Bổ sung thêm kho bài tập Tiếng Anh theo chủ đề, Thích Tiếng Anh chia sẻ “100 Bài tập trắc nghiệm câu điều kiện trong Tiếng Anh có đáp án” bản PDF. 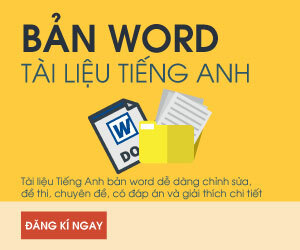 Tài liệu giúp bạn ôn lại lý thuyết về câu điều kiện loại 1, loại 2, loại 3 thông qua luyện tập các dạng câu hỏi được phân bố từ mức độ cơ bản đến nâng cao có đáp án tham khảo, phù hợp cho các bạn học sinh lớp 8, lớp 9,… ôn luyện tốt phần ngữ pháp Tiếng Anh này. 1.We’ll have lunch outside in the garden, _____ it’s too cold. 2.John _____ win more races if he trained harder. 3.If the machine _______, press this button. The lecturer didn’t know what he was talking about, but if Dr Mason _____ I would have listened carefully. 5.I can’t understand what he sees in her! If anyone treated me like that, I _________ extremely angry! 6.If you _____ up all the orange juice that was in that carton, you ought to go out and get some more. 7.Rachel will be pleased _________ she passes her driving test. 8.I _____ you sooner had someone told me you were in hospital. 9.If you can give me one good reason for your acting like this, _____ this incident again. 10.You can use my car ___________ you drive carefully. 11.If everyone _____ an extra hour a day, it would greatly increase production. 12.If energy _____ inexpensive and unlimited, many things in the world would be different. 13.Don’t bother to ring me _________ it’s important. 14.If you help me with this exercise, I ________do the same for you one day. 15.According to the timetable, if the train _______ on time, we _______ arrive at 5.30. 16.If I could speak Spanish, I _____ next year studying in Mexico. 17.The bus won’t stop __________ you ring the bell. 18.You’d better take a coat ________ it gets cold. 19.If you _____ to my advice in the first place, you wouldn’t be in this mess right now. 20.If it _____ fine tomorrow, we will go to the coast. 21.If I ask Paul nicely, he_____ us. 22.You_____ yourself ill if you don’t eat properly. 23.If the ball _____ the line, that would have been the end of the game. 24._____ more help, I could call my neighbour. 25.Come on! _____ we hurry, we’ll miss the plane! 26._____ you like to see my stamp collection? 27.I didn’t get home until after midnight last night. Otherwise, I _____ your call. 28.If Jake _____ to go on the trip, would you have gone? 29.If I found Rob’s phone number now, I _____ him about the change in plans. 30.If I see him, I _____ him a gift. 31.If I had a typewriter, I _____ it myself. 32.If you don’t keep silent, you ________wake the baby up. 33.If I had known that you were in hospital, I _____ you. 34.I don’t understand this point of grammar. I wish I ______ it better. 35.It never stops raining here. I wish it ______ raining.